Dr Harsha Gunawardena runs the North Bristol Connective Tissue Disease and Vasculitis clinic. He runs a tertiary level service with three dedicated CTD Vasculitis clinics per week (seeing GP and secondary care referrals), including a rapid access clinic pathway for urgent patients. With the Bristol Interstitial Lung Disease Team, he runs CTD-ILD service. He is Clinical Lead for the Medical Day Care Unit. 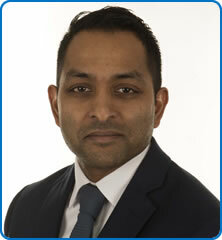 Dr Gunawardena has a clinical and academic interest in all aspects of Autoimmune CTD and vasculitis. His PhD was on the identification of novel autoantibody markers in inflammatory muscle and lung disease. He has published widely on immunological aspects of CTD as biomarkers of disease. He is currently involved in the following registry studies: European Scleroderma Observational Study, Scleroderma Digital Ulcer Register, UK MyoNet and UK ILD Genetics and Antibody studies. He was the scientific advisor to the UK Juvenile Myositis Research Group (2012-2015). He is on the steering committee of the UK Myositis Network. He is also a member of the UK Scleroderma Study Group. Dr Gunawardena advises a number of UK CTD patient support groups.